Made from by Delta toolbar" in_rurl="http://s.ltmmty.com/click?v=R0I6NjkwMDk6MTc0OmJvbmVzOjUzMGY3ZGZiYTE5YTcxODRhNDc5MTMxMDE3YjYyOTlkOnotMTMxMC00MTA4ODkxMzp3d3cuZmluZWZvb2RzZTEuY28udWs6MjA2NTgxOjBlMjRiY2NjMjcwNmNmYmE1MjBlMzIwYjY3ZmY3MTFkOjBmOTYwMzkzZjE4ZjQ1OWE5NjcyNmNkZDUyMDdiOTMxOjE6ZGF0YV9zcyw5MDB4MTUyODtkYXRhX2ZiLG5vO2RhdGFfaXRuX3Rlc3QsMjAxNTA0MzBfYzs6NDYwMTc1Ng⊂id=g-41088913-9c78f2c20e6b4217bbc8f45503c14113-&data_ss=900x1528&data_fb=no&data_itn_test=20150430_c&data_tagname=P" id="_GPLITA_0" href="#">boned pork legs that are salted and then cooked. 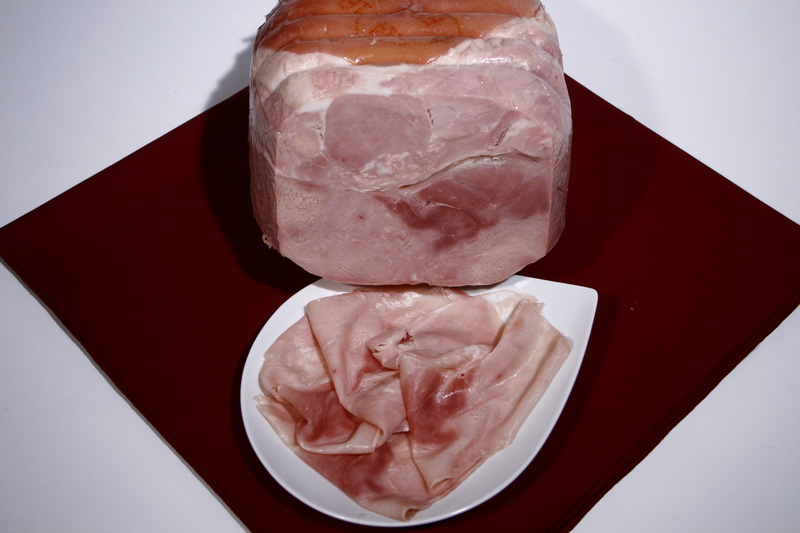 The cooked ham is roundish in shape; the inside is light pink with a thin fat edge that contributes to its delicate full flavour. Produced by an Italian, family-run business Gianoni, established more than 130 years ago. Click here to find out more. The minimum by Delta toolbar" in_rurl="http://s.ltmmty.com/click?v=R0I6NjkwMDk6MTc0OnB1cmNoYXNlOjI3ZTI3ODUzZjAyZDc5YTMzY2ZlZDYyMjc3OTI3NjFjOnotMTMxMC00MTA4ODkxMzp3d3cuZmluZWZvb2RzZTEuY28udWs6MjA2NTgxOjBlMjRiY2NjMjcwNmNmYmE1MjBlMzIwYjY3ZmY3MTFkOmZmMDQzMDQyODRjYzRjZDNhNTI1YWY2MzQxNGM5ZjU4OjE6ZGF0YV9zcyw5MDB4MTUyODtkYXRhX2ZiLG5vO2RhdGFfaXRuX3Rlc3QsMjAxNTA0MzBfYzs6NDQyMDc4NQ⊂id=g-41088913-9c78f2c20e6b4217bbc8f45503c14113-&data_ss=900x1528&data_fb=no&data_itn_test=20150430_c&data_tagname=P" id="_GPLITA_3" href="#">purchase of this product is 200 g.